In the two years since All American Driveways and Pool Deck Inc. has been in business, the Hollywood company and its owner, John T. Pluto, have been the subject of dozens of complaints and several lawsuits. Consumers have complained that the company took payments for jobs that were not completed, did substandard work and, in a few cases, signed contracts for jobs they are not licensed to do, such as screen enclosures and patio construction. 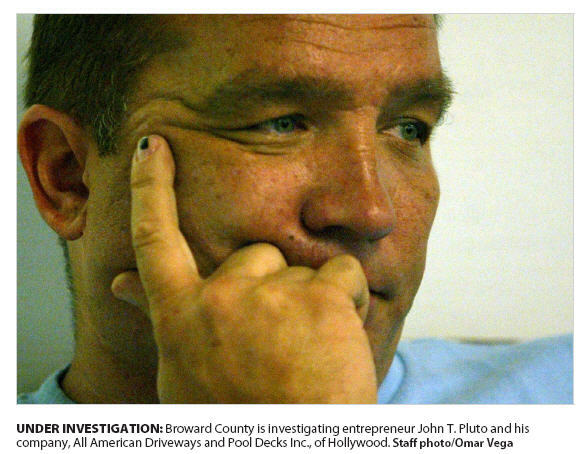 Broward County officials are investigating All American and Pluto, a longtime South Florida entrepreneur. Pluto is on probation until 2008, after pleading guilty to defrauding Miami-Dade County consumers while working with a now-defunct company called Affordable Concrete. Under the terms of his probation, he is prohibited from entering into construction contracts, but he can work in the construction field, court records show. The South Florida Sun-Sentinel interviewed dozens of All American customers, reviewed civil lawsuits, complaints filed with local and state agencies and other records — all indicating several businesses Pluto was associated with or owned since the early 1990s have been plagued with problems. State regulators and Broward County building licensing officials say there is no law preventing Pluto from continuing to take on new customers or requiring him to disclose the existing complaints or problems in his past. But consumer advocates said the case shows there are gaps in state regulations that prevent authorities from halting operations of what officials call “serial entrepreneurs” who repeatedly violate state and county laws yet continue to form and run new businesses. “There seems to be a loophole in every state and bad builders who get in trouble tend to build under another guy’s license,” said Nancy Seats, president of Homeowners Against Deficient Dwellings, a consumer advocacy group. Pluto has denied any wrongdoing. His past legal troubles and criminal charges were the result of bad judgment and misunderstandings with past clients, he said. Last March, Pluto purchased a 3,240-square-foot, four-bedroom, four-bath home in North Miami Beach with an appraised value of $790,000. Marcy Knight, a Margate homeowner, is one of dozens of consumers who filed complaints against All American with county licensing officials, contending the company completed substandard work on driveway improvements to her property. After two failed inspections, the company completed the job in August, seven months after she hired the company. She thought her troubles were over but on Aug. 19, Knight received a notice from the company’s concrete supplier, notifying her that a lien could be placed against her home. Davie Concrete Corporation mailed 34 lien notices to homeowners because All American has not paid the supplier in past weeks. “I freaked out,” said Knight, 42. While authorities said they are investigating the complaints against Pluto and All American, also under investigation is Lawrence D. Krezmien because he holds the contractor’s license. State records also list Pluto, 44, his wife Elizabeth Leeds, 51, and Krezmien, 56, as registered agents for All American. During a Licensing Board hearing Sept. 6, Krezmien, 56, said his duties at All American were limited to revising permits a few times a week and inspecting jobs on occasion. Pluto was the main force behind the business, Krezmien said. Officials have received a growing number of contractor complaints in recent years, partly due to the busy hurricane seasons of 2004 and 2005. In Broward County, 1,064 consumers filed contractor complaints with county building officials in 2005. This year, building officials have received more than 840 complaints and they are expecting 1,500 complaints before the year ends. Palm Beach County consumer affairs officials said contractor complaints rose from 98 filed in 2004 to 318 in 2005. About 483 complaints have been filed so far this year. Court and government records indicate a number of irregularities with companies Pluto has been associated with, since the 1990s. Cease and desist order: On Aug. 31, the Florida Board of Professional Engineers issued a cease-and-desist order against All American for improperly using the phrase “certified engineers” on business cards and contracts. “None of the principals of the company have an engineer license,” said Jack Beamish, an investigator with the state Board of Professional Engineers. Pluto declined to comment on the state investigation. Money refund ordered: Last March, the Broward County Central Licensing Examining Board instructed Krezmien and Pluto to return money to two consumers after complaints were investigated. Officials are investigating 20 similar complaints. Pluto claimed all Broward cases were handled and closed, declining to elaborate. Grand theft: In 1993, Pluto was charged with grand theft and contracting without a license, court records show. He pleaded no contest and got probation. At the time, he was the registered agent of Tri-County Home Improvement Inc. and Tri-County Roofing-S Florida, both based in Miami-Dade, according to Florida Corporation records. Pluto also described himself as the company’s owner in a Sun-Sentinel interview. False checks: In 1998, Pluto pleaded no contest to three counts of issuing worthless checks amounting to $45,837, which he cashed to his name using Tri-County checks, court records show. Adjudication was withheld and he got a suspended sentence. Permitting problems: In 1999, Department of Business and Professional Regulation Construction Industry Licensing Board ruled Tri-County Home Improvement and its licensed contractor Carlos R. Diaz failed to file permits and complete jobs after taking more than $116,000 from seven Broward and Miami-Dade consumers. Diaz lost his license. Numerous attempts by the Sun-Sentinel to contact Diaz were unsuccessful. Pluto said he knew nothing about the permitting problems. Fraud charges: In 2005, Pluto pleaded guilty to 13 felony charges that included organized fraud, grand theft and acting as a contractor without certification while associated with Affordable Concrete. As a part of his plea, Pluto paid thousands of dollars in restitution to six customers. In an extensive interview with the Sun-Sentinel, Pluto did not deny that he had has some past legal problems, but would not elaborate. He said he paid his dues to society and has a right to make a living. The South Florida Sun-Sentinel published this story on October 15, 2006. Mr. Pluto is currently serving a 10-year prison sentence after he violated the terms to his probation and left Florida to evade paying the increasing number of unsatisfied consumers. Torres wrote several articles about these issues including county investigator’s probe into Mr. Pluto business practices in Broward County. Mc Nelly Torres was a consumer watchdog reporter for the Sun-Sentinel from 2005-2009. Yvonne Lowenstein spent years saving to build a Florida room in her tiny Boca Raton home. On Nov. 4, 2006, she signed a contract with Roger Griffis Construction Inc. of Palm Beach Gardens and gave the company a $9,700 deposit —nearly half of the total cost — to complete the work. But more than a year later, the job is far from complete. In June, business owner Roger W. Griffis stopped working after Lowenstein refused to make another payment until she saw further progress on the job. 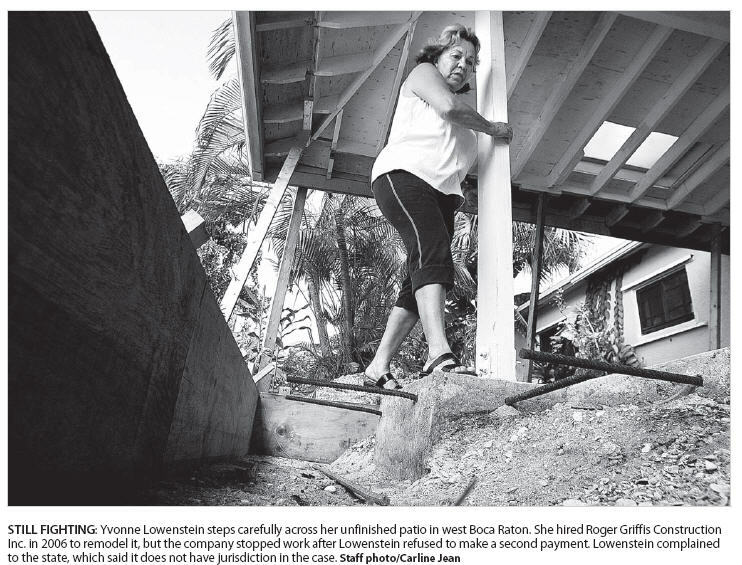 “I had no idea that people who have problems with contractors have to endure such aggravation, “ said Lowenstein, 66. Like many homeowners, Lowenstein tried to resolve the dispute before she filed complaints with local and state agencies last spring. Thousands of Floridians file complaints against contractors every year and most wait more than a year for a resolution. Meanwhile, their homes remain in disrepair. Antoinette Wible, 75, waited several years for resolution of a complaint she filed against Griffis over a patio project. Wible hired Griffis in October 2000 to enclose her West Palm Beach patio and gave him $8,700. She said Griffis did some work and abandoned the job. She filed a complaint with the state in 2001, but state officials didn’t resolve the case until 2005, when they ruled in her favor. In an interview with the South Florida Sun-Sentinel, Griffis refused to comment about past complaints and denied any wrongdoing in Lowenstein’s case. He acknowledged the delays, but said he spent four months trying to resolve a complication over a 1992 permit involving Lowenstein’s home that prevented him from starting the job. Lowenstein thought that state officials would help resolve her dispute with Griffis when she filed the complaint in May. But last December she got aletter from the state announcing her case had been closed because regulators lacked jurisdiction. State officials declined to comment on the case when the Sun-Sentinel requested comment about the decision. “It is certainly not an indication that you do not have a valid civil case,” the letter read. Lowenstein said she now regrets not doing her homework. Had she done so, she might have discovered that Roger Griffis’s contractor license is on probation until April 2009, but under the terms of his probation he can still do business. work, abandoning jobs and failing to file permits, as a result of several consumer complaints, records show. Lowenstein, said she plans to appeal her case. In the two years since the intense hurricane seasons of 2004-2005, consumer complaints against state-licensed contractors have risen dramatically along with the state’s backlog of unresolved cases, Florida records show. As a result, consumers who file complaints are waiting twice as long for resolution as they did before Hurricane Wilma, with just over half the cases taking more than a year to resolve. Alexis Antonacci, a spokeswoman with the Department of Business and Professional Regulation, which regulates contractors and other professionals licensed by the state, attributed delays in resolving complaints to insufficient resources and staff needed to resolve the growing number of cases. The number of cases is increasing. Consumer complaints against contractors have risen 83 percent over the past four years, with marked increases during and after the active hurricane seasons of 2004 and 2005. In 2003, 5,733 complaints were filed, followed by 8,758 in 2004, 11,557 in 2005 and 10,498 in 2006. Enforcement staffing remains flat. Although case filings have grown, the number of full-time state investigators probing contractor complaints since 2003 has remained the same — 50, with 15 assigned to South Florida counties. After the 2004-05 hurricane seasons, which included Hurricane Wilma, the state added 14 temporary positions, focusing on unlicensed activity, after reports of hurricane damages statewide. Most of these investigators worked for several months and the positions have been eliminated. Delays are growing. Backlogs in complaints have slowed the pace of the state’s review process. State officials project that more than half of the consumers who filed complaints in fiscal year 2006 will have waited more than a year for a resolution, compared to 38 percent in fiscal year 2005. Officials said the average review takes 21 months to complete. Disciplinary actions are few. One in 10 complaints has resulted in disciplinary action against contractors in the past four years by the Florida Construction Industry Licensing Board, state records show. Antonacci said the state investigates all complaints, but noted not all have merit. Consumer complaints move through a complicated process. All complaints filed with the state are investigated. If the department determines the case has merit, it is referred to the Construction Industry Licensing Board. The 16-member board is comprised primarily of contractors but also consumer advocates and attorneys. Members, appointed by Gov. Charlie Crist, are paid $50 a day during meetings, plus travel and hotel expenses, to serve on the board. The board meets once a month at different locations throughout the state. Contractors can challenge consumer allegations or appeal the board’s decisions, which can delay resolution of a complaint. The state has the power to fine, suspend and revoke a contractor’s license for an array of infractions including financial misconduct, working without a permit and abandoning a job. Consumers can sue in civil court. Or they can turn to other agencies, including the Better Business Bureau and local and county regulators, to have their cases against contractors resolved. But many of these agencies, including the Better Business Bureau, have limited powers and while they can mediate cases, both parties must cooperate. Dennis L. Moore, director of the Palm Beach County Consumer Affairs Division, said he would like to see new regulations that provide more powers to local agencies over cases against state-licensed contractors to streamline the process and speed resolutions. When state officials rule in favor of a consumer, the homeowner can recover money lost from the state Homeowners’ Construction Recovery Fund. Created by the Legislature in 1993 and supported by fees paid by contractors to the state. The state has awarded more than $9.5 million in 746 cases over four years. The licensing board oversees the fund and determines eligibility for an award. The South Florida Sun-Sentinel published this story, on February 10, 2008, along with two side bar stories both posted here. While negotiating with a roofing company last spring, David Massey of Plantation became suspicious after a roofer representative missed a meeting with Massey’s insurance company to discuss the job. Although Massey signed an initial agreement, he stopped discussions with the roofer and started contacting past clients. 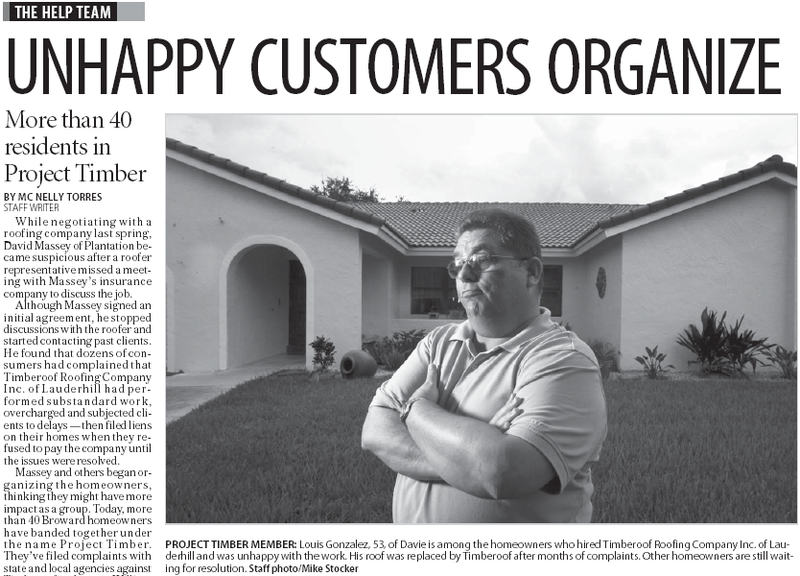 He found that dozens of consumers had complained that Timberoof Roofing Company Inc. of Lauderhill had performed substandard work, overcharged and subjected clients to delays — then filed liens on their homes when they refused to pay the company until the issues were resolved. Massey and others began organizing the homeowners, thinking they might have more impact as a group. Today, more than 40 Broward homeowners have banded together under the name Project Timber. They’ve filed complaints with state and local agencies against Timberoof and owner William E. Ferguson. The group has even c r e a t e d a Web site on contractor complaints. Despite those efforts, several homeowners told the South Florida Sun-Sentinel they are still waiting, in some cases more than a year, to resolve complaints against Ferguson. Ferguson has denied allegations of overcharging and substandard work. “If we have a problem and I know about it, we’ll take care of it,” said Ferguson, 55. Annie Defalco-Ber hired Timberoof in 2006 to replace the roof on her Plantation home. But she was not satisfied with the job and said she has suffered water damage after workers left the roof exposed. In July, Defalco-Ber filed a complaint, which is still pending, with the state. “The whole thing was horrible from the start,” said Defalco-Ber about the delays and problems with the roofing project. Timberoof Roofing’s Web site features a picture of Ferguson standing next to former President George Bush and his wife, Barbara — former clients of the now-defunct Timberoof Roof and Siding Co. in Houston, Texas. A letter from Bush, posted on the site, thanked the roofer for the job completed at his Houston home. What the Web site doesn’t publicize is that the Florida Department of Financial Services cited Ferguson in March for advertising or acting as an insurance adjuster without a license as an agent of Timberoof. Ferguson paid a $3,500 fine and signed a consent order agreeing to stop these practices. Eight months later, insurance fraud investigators charged Ferguson for the same civil infraction. Ferguson also has drawn the attention of state regulators in past years. On Jan. 25, 2006, the state rejected Ferguson’s application to become a licensed general contractor, citing a lack of qualifications, records show. In December 2005, the state issued a $500 fine for using another roofer’s license after he moved from Port St. Lucie to Lauderdale Lakes. Ferguson said the state citations were misunderstandings that were quickly resolved. He contends that Massey and homeowners filed complaints because they want to ignore the contracts and keep the insurance money. After talking to many unsatisfied homeowners, Massey decided not to sign a final contract with Timberoof. But Massey, who has helped homeowners set up meetings and file complaints, said those who have disputes with Ferguson are simply trying to get their money back or have work completed. The South Florida Sun-Sentinel published this story, on February 10, 2008. State insurance investigators arrested Ferguson the same day Torres interviewed the contractor.